Associates of Vietnam Veterans of America (AVVA) is a national, nonprofit, membership organization dedicated to advancing the awareness of issues affecting Veterans, their families, and their communities. AVVA strivies to ensure that ALL veterans attain the honor, respect, and benefits they deserve. We lend our expertise, support, and leadership to all veteran related programs, community service, and social activities, while remaining actively involved in our own programs and educational endeavors. AVVA is made up of Veterans of all eras, families and friends of Veterans, and all persons who support Veterans' issues. AVVA is a catalyst for action, healing, reconciliation, mutual support, and fellowship. With more than 10,000 members, we are a thriving and strong organization. Read the history of AVVA at this link: AVVA History. AVVA is a non-partisan, tax exempt organization. 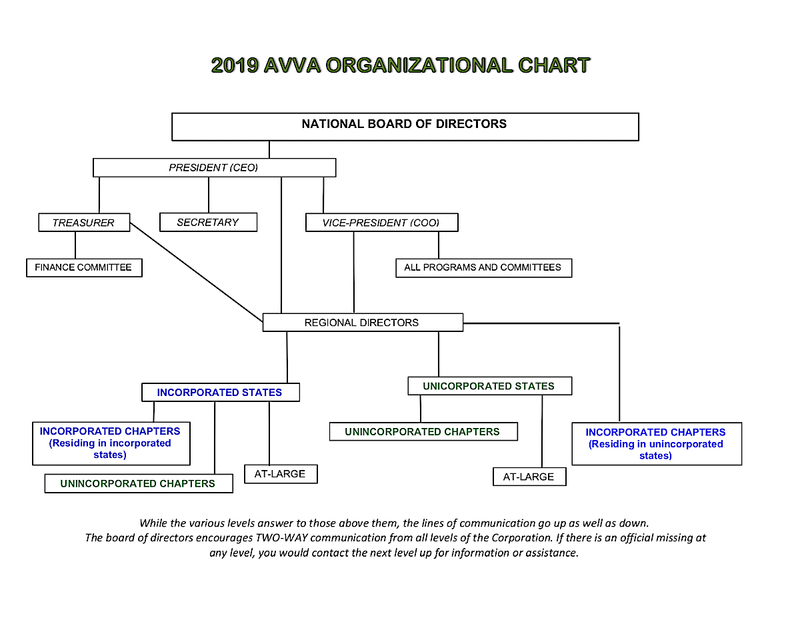 AVVA is similar to any other non-profit business, with an organizational structure like most Corporations. Below you can view an organization chart, which will help to understand how the different levels interact. all the way up the chain.